Upload your mind? Here's a reality check on the Singularity. Douglas Rushkoff: I think we still know so little about what it means to be human that the confidence with which we think we can upload ourselves to silicon or recreate ourselves with algorithms is shocking to me. The only ones out there who think they know what human consciousness is are computer engineers. If you talk to actual brain researchers and neuroscientists, they say, we're nowhere close. We don't even know for sure what goes on in a single square centimeter of soil. We're still trying to teach agriculture companies that the soil is alive, that it's not just dirt that you can put chemicals on. It's a living matrix. If we don't even know what a single centimeter of soil is, how do we know what the human brain is? We don't. We don't know what the source of consciousness is. We don't know where we come from. We don't even know if there's a meaning to this universe or not. Yet, we think that we can make a simulation that's as valid as this? Every simulation we make misses something. Think about the difference between being in a jazz club and listening to a great CD. There's a difference, you know. And some of those differences, we understand, and some of them, we don't. So when I see people rushing off to upload consciousness to a chip, it feels more like escape from humanity than it is a journey forward. And I get it. Life is scary. I mean, women, real-life women, are scary. You know, the people are scary. The moisture is scary. Death is scary. Babies are scary. Other people who don't speak the same language or have the same customs, they're scary. All sorts of stuff is scary. And I understand the idea of this kind of having a Sim City perfected simulation that I can go into and not have to worry about all that stuff I don't know, where everything is discrete, everything is a yes/no, this/that, all the choices have been made. There's a certain attractiveness to that, but that's dead. It's not alive. There's no wonder. There's no awe. There's nothing strange and liminal and ambiguous about it. I was on a panel with a famous transhumanist, and he was arguing that it's time that human beings come to accept that we will have to pass the torch of evolution to our digital successors. And that once computers have the singularity and they're really thinking and better than us, then we should really only stick around as long as the computers need us, you know, to keep the lights on and oil their little circuits or whatever we have to do. And then, after that, fade into oblivion. And I said, hey, no, wait a minute. Human beings are still special. We're weird. We're quirky. We've got David Lynch movies and weird yoga positions and stuff we don't understand, and we're ambiguous and weird and quirky. You know, we deserve a place in the digital future. And he said, oh, Rushkoff, you're just saying that because you're human. As if it's hubris, right? Oh, I'm just defending my little team. And that's where I got the idea, all right, fine, I'm a human. I'm on Team Human. 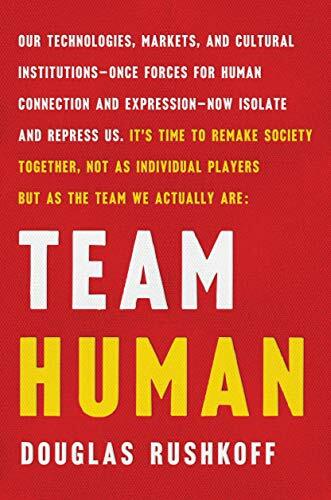 And it's not Team Human against the algorithms or against anything other than those who want to get rid of the humans. I think humans deserve a place. Certainly, until we understand what it is we are, we shouldn't get rid of us. And as far as I'm concerned, we're cool. We're still weird and funny and wonderful. And yeah, we destroyed the environment. We did really nasty things. But I would argue we do those things when we're less than human. We do those things when we can dehumanize others. You can't have slaves if you're thinking of those as people. You can only have slaves if you're thinking of them as something other than people. And this desire to transcend the human, I feel like it's excusing a whole lot of behaviors. It's excusing a whole lot of dehumanization. It makes it easier to send kids into caves to get rare earth metals for your phone. It makes it easier to create toxic waste everywhere. It makes it easier for you to think of the human timeline as having a beginning, middle, and an end, because we're going to transcend it. And that's a sick Western, neoliberal, growth-based, apocalyptic myth that could very well end our species. But really, I would say to the detriment of our little universe. Though computer engineers claim to know what human consciousness is, many neuroscientists say that we're nowhere close to understanding what it is, or its source. Scientists are currently trying to upload human minds to silicon chips, or re-create consciousness with algorithms, but this may be hubristic because we still know so little about what it means to be human. Is transhumanism a journey forward or an escape from reality?